From Malmö: Drive E22 toward Lund/Kalmar. Take Exit 21 at Trafikplats Gastelyckan. Turn right toward Dalby and then left in the roundabout. Continue on Sandbyvägen/Lundavägen to Södra Sandby. Drive through Södra Sandby and continue straight through the roundabout (do NOT exit to Sandby Mosse at this point) and continue on Revingevägen to Revinge for approximately 3 km. At the Flyinge/Sandby Mosse intersection, turn right to Sandby Mosse and drive approximately 1 km. Turn left immediately following the second M sign (for meeting place) and just before the sign to Björkelunds Logi & Trädgård and continue on the gravel road to the farm. From Lund: Drive Sandbyvägen/Lundavägen toward Södra Sandby. Drive through Södra Sandby and continue straight through the roundabout (do NOT exit to Sandby Mosse at this point) and continue on Revingevägen to Revinge for approximately 3 km. At the Flyinge/Sandby Mosse intersection, turn right to Sandby Mosse and drive approximately 1 km. Turn left immediately following the second M sign (for meeting place) and just before the sign to Björkelunds Logi & Trädgård and continue on the gravel road to the farm. From Flyinge Kungsgård royal estate: Drive south on Stuterivägen for approximately 750 meters. Turn left at the sign for Revinge and drive through the small village. Continue straight for approximately 3.5 km. Cross Revingevägen and drive toward Sandby Mosse for approximately 1 km. Turn left immediately following the second M sign (for meeting place) and just before the sign to Björkelunds Logi & Trädgård and continue along the gravel road to the farm. Southbound on E22: Take Exit 24 at Trafikplats Roslöv and then Roslövsvägen south toward Flyinge (a long ascent). In Flyinge, drive straight through a small roundabout and follow the sign for Flyinge Kungsgård/Södra Sandby. Continue on Stuterivägen (over the river Kävlingeån) past the Flyinge Kungsgård royal estate. Drive south on Stuterivägen for approximately 700 meters. Turn left at the sign for Revinge (in front of a white half-timbered house) and drive through the small linear village. Continue straight for approximately 3.5 km. Cross Revingevägen and drive toward Sandby Mosse for approximately 1 km. Turn left immediately following the second M sign (for meeting place) and just before the sign to Björkelunds Logi & Trädgård and continue along the gravel road to the farm. From Lund Central Station, take Bus 155 (destination Harlösa) via the Södra Sandby bus station to Mossevägen. The farmhouse is a walk of approximately one kilometer away. You can also take Bus 166 to the Södra Sandby bus station and change there to Bus 155. Check the times with the local traffic operator Skånetrafiken to avoid long waits in Södra Sandby. There is a lovely bicycle path between Lund and Södra Sandby, and from there you have a choice of two paths to the farm. 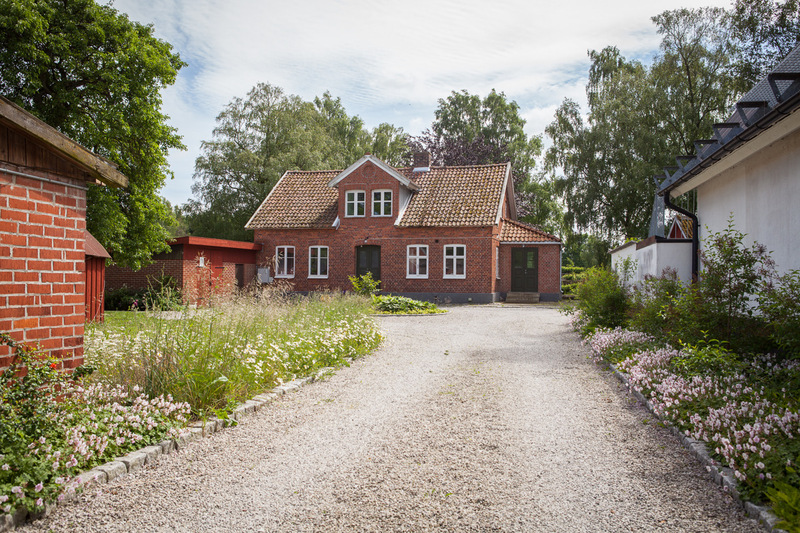 Write to info@bjorkelunds.se for more information on how to bike to the farmhouse. The closest airports are Malmö Airport/Sturup and Copenhagen Airport/Kastrup. The closest train station is Lund Central Station. Regional train connections on the X2000 from Stockholm, Gothenburg and elsewhere in Sweden. Read more about the Swedish national train system, SJ . The Öresund train system connects with Copenhagen, Helsingör, Kristianstad, Karlskrona, Kalmar and Gothenburg. Learn more about the Öresund trains at Öresundståg and at Skånetrafiken. Pågatågen, the local trains, connect Lund with Malmö, Höör, Kristianstad, Landskrona, Ängelholm, Teckomatorp, Helsingborg and other towns. Read more about Pågatågen at Skånetrafiken.